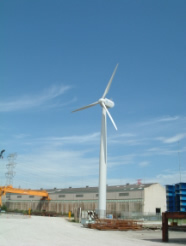 Renewable Energy Business | Komaihaltec Inc.
Komaihaltec has developed 300kW wind turbine system, KWT300, and installed its prototype in Futtsu, an industrial city facing Tokyo Bay. KWT300 has been operating since 2006 in Futtsu with no trouble. In Japan, there is not much flat land. It is difficult to secure large areas suitable for the installation of mega solar power plants. Our ""Sky Solar"" system can achieve mega power generation that can coexist with the existing topographical features and the landuse.